In the wake of the tragedy in Flint, Michigan, we now know the toxic threat of lead in drinking water extends to thousands of communities across the country. 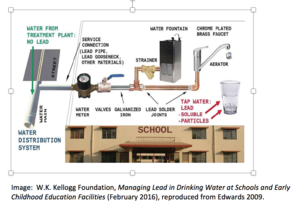 In fact, lead is even contaminating drinking water in schools and pre-schools - flowing from fountains and faucets where our kids drink water every day. Lead is highly toxic, especially for children. There is no safe level of lead. Lead is contaminating drinking water at schools. As more schools test their water for lead, they are finding widespread contamination. A National Resource Defense Council study found that Florida had the second worst water quality in the nation; multiple counties across Florida had violations for levels exceeding the EPA’s Lead Action Level in 2015 [Source: NRDC What’s in Your Water]. Environment America and U.S. PIRG found that 24 Florida schools had lead in their water in two counties [Source: Get the Lead Out Feb 2017 Report]. The report stated that after testing the water source and finding no lead contamination, it was determined that the source of lead was most likely aging plumbing systems. Schools’ water is laced with lead in all kinds of communities – urban neighborhoods, rural towns, and affluent suburbs as well. In all likelihood, the confirmed cases of lead in schools’ water are just the tip of the iceberg. Any school built before 2014 is likely to have a significant amount lead in its pipes, plumbing, and/or fixtures. And where there is lead, there is a risk of contamination. 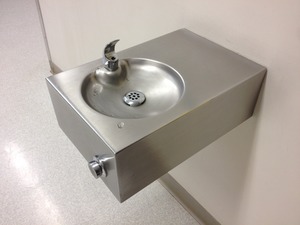 WUFT News Article: Should Water in Florida's Schools be Tested for Lead? Install Filters Now: Installing filters certified to remove lead is an easy, low-cost step schools can take to begin protecting children immediately. Filters should be installed and maintained on all faucets and fountains used for cooking or drinking in schools. Get the Lead Out: replacing pipes, plumbing, fountains and/or fixtures that contain lead is the most effective, permanent solution to prevent contamination of the water our children drink at school (or elsewhere). Remove Lead Service Lines: if the pipe connecting your school (or home or child care center) to the water main in the street is made of lead, that lead service line is likely to be the largest single source of water contamination. Have it replaced as soon as possible. 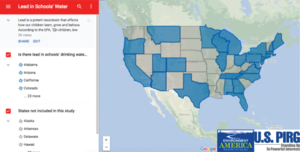 Doctor’s Orders - 1 part per billion (ppb): The American Academy of Pediatrics recommends that schools keep lead concentrations in water no greater than 1 ppb. Taps used for drinking or cooking that test above 1 ppb of lead should be shut off until remediated. Ace the Test: regularly test all outlets used for drinking or cooking, using proper sampling methods that are more likely to detect lead contamination. Communicate: plans and actual steps taken to prevent lead contamination, along with all test results, should be made easily accessible (including online) to parents, teachers, and the public. Outlets should clearly indicate when filters are due to be replaced. Lead corrosion is highly variable. As a result, tests sometimes fail to detect lead – or the full extent of lead - in water, especially when sampling is done improperly. Share all your work with the class. Sometimes officials or the media only report lead levels in water that exceed 15 (or 20) parts per billion (ppb). But there is no safe level of lead for children. Ask to see all test results detecting any level of lead in the water. Cheating on the test? Contamination tends to be higher the longer water sits in contact with lead-bearing pipes or fixtures. So samples taken after flushing of the system, or even regular water use, are unlikely to detect the full extent of lead contamination at school. Act now to protect children’s health. We already know that wherever there is lead in a water delivery system, there is a risk of contamination. Schools need not wait for test results before taking action to protect our children’s health. Act Now: Tell your Local Officials that we need to protect our children from lead contamination!